Find out what our experts have to say about Yamaha FZ-S FI! The Yamaha FZ-S gets graphics and dual-tone shades to make it stand apart from the standard bike. It also features a small windscreen on top of the console and mechanically is similar to the Yamaha FZ. The least priced variant is Yamaha FZ S FI (V 2.0) STD priced at Rs. 99,442 and the most priced variant is Yamaha FZ S FI (V 2.0) Dual Disc priced at Rs. 1,03,850. Choose the Yamaha FZ-S FI which fits the bill of you. Before the launch of the Yamaha FZ, there were just commuter bikes. Naked streetfighter segment was unheard of. Bikes which had thin profile tyres to give good mileage and were not that fun. There was no bike which had thick tyres like imported sports bikes, even the first Yamaha R15 had slim tyres for greater fuel efficiency. Bike enthusiasts really wanted a bike that they could have fun and use it for their daily commute as well. Yamaha could understand this very well and launched the Yamaha FZ16 in 2008. Bikers went crazy as they had never seen such a bike that too with thicker front and rear tyres. FZ16 was modelled on its elder sibling FZ1 but with a scaled down engine capacity. Now the FZ16 selling like hot cakes but there were small issues here and there with it. So, Yamaha decided to launch another version of the bike with reworked features and named it FZ S FI. Yamaha FZ S FI is currently in its second generation and named Version 2.0. The bike now comes with better features like fuel injection, rear disc brakes, new graphics, non-slip seats, better suspension and many more. This bike currently competes with the likes of Suzuki Gixxer, Bajaj Pulsar, TVS RTR, and Honda CB Hornet. Yamaha FZ S FI Version 2.0 is available in two variants, and even the colour preference decides the price point. 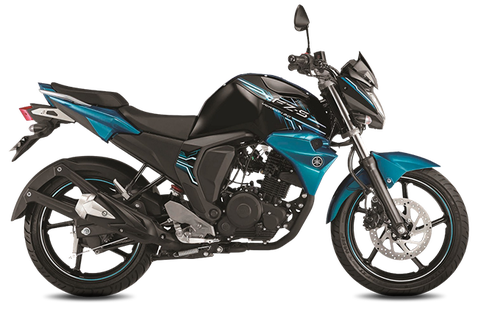 The standard FZ S FI is Rs.83,542 whereas if you choose this variant in Darknight colour the cost will be Rs.84,512. FZS-FI with Rear Disc Brake in Armada Blue colour scheme retails at Rs.86,542 while the other colours in this variant are available at Rs.87,542 (all prices are Ex-Showroom, Delhi). FZ-S from Yamaha is one of the most triumphant and tastefully crafted naked street motorcycles till date. The bike is inspired by the iconic street bike Yamaha FZ1 and comes with muscular body design and superior performance. At the front, the bike includes a triangular shaped headlamp section with a positioning light at the top. The small black visor on top of the headlight gives the bike a straight naked appearance. On the side, we have a wonderfully crafted muscular tank. It now sports new panels and a new graphics scheme which looks quite attractive. At the rear, the tail end section is now given a facelift by giving it a new sporty tail lamp and a brand new tyre hugger as well. The seats have now changed as the earlier gen Yamaha FZ S had a sporty single seat whereas FZs V2.0 comes with a split seat. Rear grab rails look very striking in appearance are impressively mounted on the rear side panels. The midship exhaust muffler, not only looks goods with its sharp looks but also has its advantages of weight reduction due to mass concentration, and shorter length. The instrument console is now completely digital with readouts including speedometer, tachometer, fuel gauge, and trip meter. FZs V2.0 is currently available in eight colours of Matte Green, Armada Blue, Darknight, Opal White, Knight Red, Lightning Cyan, Hurricane Gray and Dark Knight. FZ-S FI is powered by a 149cc, four-stroke, air-cooled, fuel-injected engine. The engine produces a max power of 12.9bhp at 8,000rpm with a peak torque of 12.8Nm at 6,000rpm. It is mated to a five-speed gearbox and uses wet multi-plate clutch setup. Yamaha FZs V2.0 employs Yamaha “Blue Core” engine concept that uses advanced sensors and actuators to calculate as well as deliver the optimum amount of fuel to the engine. This enhances both performance and mileage while retaining the excellent performance qualities of the current FZ engine. Hence you derive an optimum fuel efficiency of 53kmpl and can achieve a top speed of 107kmph on this bike. Fuel tank capacity is at 12 litres. Yamaha FZ S FI is built on a diamond chassis and offer superior stability and control. Yamaha has equipped the bike with telescopic forks at the front and with monoshock shock absorber at the rear. FZ S FI is fitted with disc brake at the front as standard and comes with an optional disc or drum at the rear. ABS is not even provided as an option, but brakes work well enough. The muscular bike runs on section 100/80-17 tyres at the front and a section 140/60-17 rear tubeless tyres with black alloy wheels. The posture is sporty but not too aggressive and gives a comfortable everyday riding experience to the rider. Safety wise the bike gets the front disc as standard, and an optional rear disc enhances the braking experience. The braking capability is better compared to drum brakes as the disc have far superior stopping power and are safer as well. Also with the advent of the BSIV, the bike gets the AHO feature in its headlight which keeps the rider and the pillion safe.